The first place of worship was known to exist in 1642 (see the Piscina page for a possible earlier chapel). This was a small building with five windows and measured forty five feet long by twenty one feet wide, and was classed as a chapel of ease. It was used by the fishermen and their families who lived in and around the town, and was served by the Vicar of the Priory Church at St. Bees. As the population grew, so did the congregation, so a bigger church was deemed necessary. The chapel had been built on Lowther Street near Chapel Street, so when the new church was started the chapel was demolished. It was in the middle of what is now Lowther Street, outside the Rum Story. The site for this was a piece of land consisting of sand dunes which were close to Sandhills Lane. The hard white stone used for the building was quarried from Tom Herds Rock at a cost of £70 (source- the Accounts Book reference YPR 23/34 at Whitehaven Record Office). This stone also gave Whitehaven it’s name. When completed, the new Church was consecrated by the Rt Rev. Dr Nicholas Stratford, Lord Bishop of Chester on the 16th July 1693. The Church was not originally dedicated to any saint- the later dedication to St Nicholas, the Patron Saint of Sailors and Children is obscure. The cost of the building was One Thousand Four Hundred and Twelve pounds Three shillings and Twopence Halfpenny. This Church served the needs of the community for almost two hundred years and the stone doorway dating from 1693 has been preserved and is at the inner entrance of the present building. Until June 1867 this Church remained as a Chapel of Ease to St. Bees (although wholly independent of its Mother Church). On 4th June 1867 St. James, Holy Trinity and St. Nicholas all became Parishes in their own right. 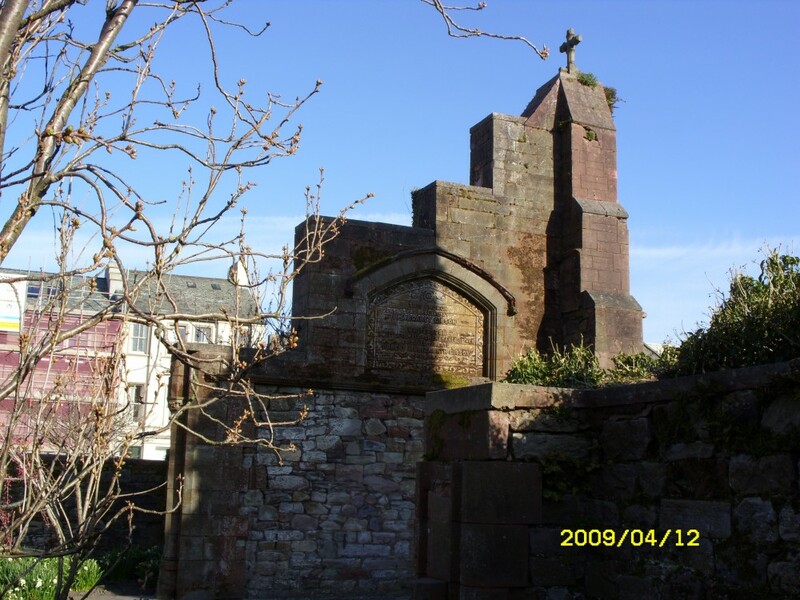 The third St. Nicholas was constructed of red sandstone from the Beggarhill Quarry, Egremont, about five miles south of Whitehaven. This was a magnificent building which consisted of Nave, Chancel, Side Chapel, Clerestory, Tower and an Organ Chamber that housed one of the finest church organs in the country, and had a seating capacity of 600 but could accommodate up to 1000 when the need arose. 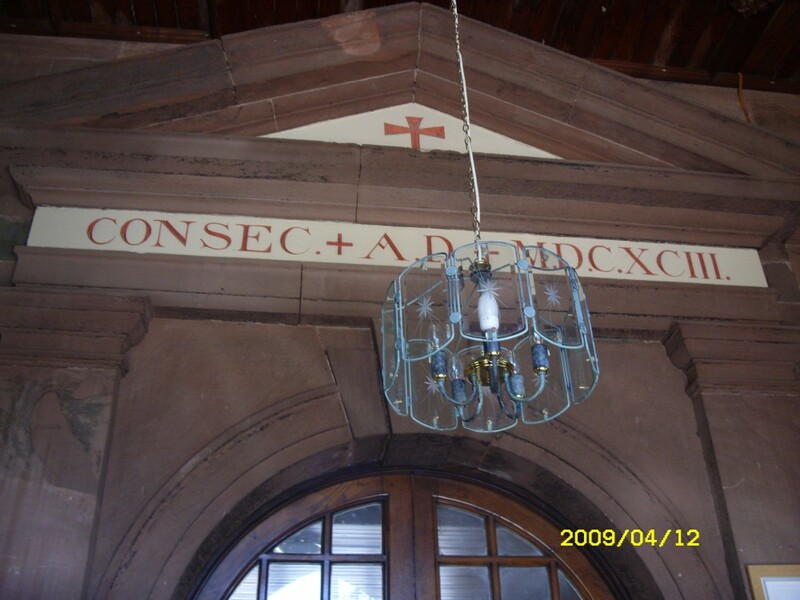 It was consecrated on the 31st of August 1883. The ceremony was performed by the Rt Rev. Harvey Goodwin, Bishop of Carlisle. The building was a gift to the town by Miss Margaret Gibson, in memory of her parents, and stood as a magnificent addition to the town until it was practically destroyed by fire 93 years later almost to the day. (For more about Margaret Gibson and her family see the botton of this page). Fire destroyed the Nave and Sanctuary on the afternoon of August 31st 1971. The High Altar, a fine example of Renaissance carving was lost in the fire and the Altar piece which had been brought from the earlier church was also lost. This depicted the Last Supper and was painted by Matthias Read. His paintings of Moses and Aaron were both saved, and after they were cleaned and restored, now hang in St James' Church on the Gallery. Rebuilding the Church was considered, but in April 1973 the Diocesan Pastoral Committee decided against this, so the Congregation united with Christ Church to form the Parish Church of Christ Church / St Nicholas in 1974. Ultimately they both united with St James Church to form the Parish of Whitehaven. The St Nicholas Tower was fitted out as an auxilliary chapel for services, and regular coffee mornings were held there. A plan was submitted to, and approved by the Parochial Church Council to make more use of the Tower by providing more facilities that would be of benefit to the community. An appeal was launched by the Mayor and the development went ahead, and became a Centre for Worship, Social activities and Tourism. (the latter facility is now to be found in the Market Hall ) Just one year later the centre was opened by the Mayor, and was dedicated by the Bishop of Carlisle. Since then it has become a welcoming focal point in the town centre for locals and visitors alike. This leaflet is about the Gibson family- Margaret Gibson was the benefactor of the third St. Nicholas Church, in memory of her parents. You are standing in the remains of that church, most of which was destroyed by fire in August 1971. The story begins on 26th September 1754 when Margaret’s grandfather (Robert) was born. He married a Margaret Perkins and one of their children was Margaret’s father, also called Robert who was born at Sandford, Warcop in Westmorland and baptised on 14th November 1790. From Margaret’s will it would appear that he was one in a large family. His early story is not known, nor has his marriage to Elizabeth been traced. It was definitely not in Whitehaven, and none of the alternatives on the IGI bear any obvious relevance to his place of birth. It is however known that Robert Gibson was an Apprentice Printer. 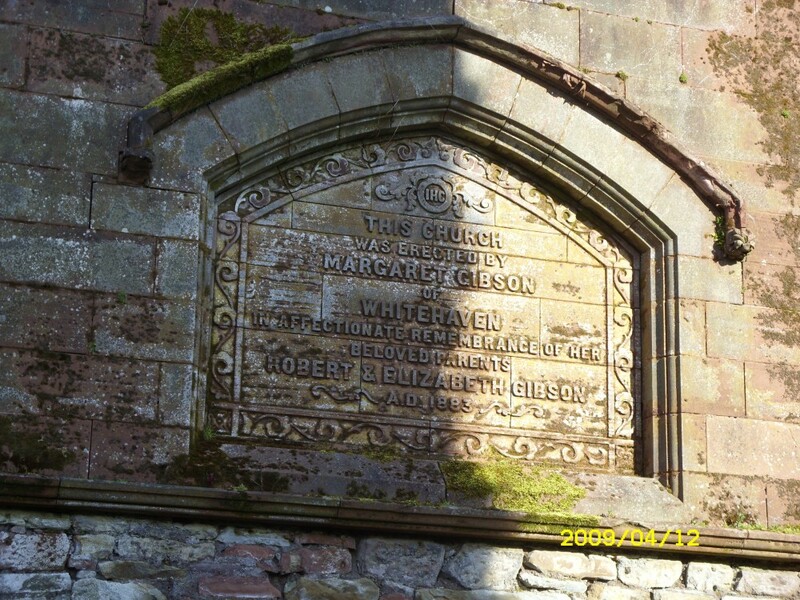 The family are in Whitehaven by 1817 because their first child, Margaret was baptised at St. James Church on 4th May 1817 by Reverend Armitsead. At that date the family are living on Scotch Street. Robert completed his apprenticeship to Mr Ware at the Cumberland Pacquet. He was successively journeyman, foreman and then general manager. Mr Ware died on 15th April 1820. Robert then became the publisher, working under the Proprietor, John Peile, until taking over completely in 1831. In 1826 the Pacquet bought up the competition of seven years- the Whitehaven Gazette. The second, and last, child Robert Henry was baptised at St James on 18th May 1819. In the 1829 Trade Directory he is listed as a Bookbinder, Printer, lithographic and copperplate printer. In his time as publisher he changed from hand printing to steam driven printing, considerably extended the size of the paper and introduced the first lithograph machine in Whitehaven. He was an original shareholder in the Whitehaven Gas Light Company (established in 1830) and a director in 1872. He was still the largest shareholder at the date of his death- an investment that was passed to his daughter. By the 1841 census the family are living at King Street- probably at number 26- the business address. His wife Elizabeth died on 2nd December 1844 at the age of 62. She was buried at St. James Church on the 6th- her gravestone, which also commemorates the rest of the Whitehaven branch of the family is number Z7 on the South Perimeter Wall. The family moved to 9 Lowther Street in around 1849, where they had one servant in 1851 although Margaret is shown as daughter and Housekeeper. He retired in 1858 and became a Magistrate on 18th October 1864. For very many years he was a Town & Harbour Trustee and was instrumental in developing the Wet Dock. From Margaret’s will we know that he also owned a Pencil Mill at Keswick. From the Cumberland Pencil Factory records this interest dated back at least to 1842. From other sources this is known to have been Ann Banks’ Mill (she was a widow), it was across the road from the current C.P. Co. Mill and had been established in 1832. In 1862 there was a legal dispute whether it retained the Banks Name or became Gibson’s. The mill was sold after Robert Junior’s death in 1907, when it amalgamated with Hogarth & Hayes and Abraham Wren. In 1908 the new business consolidated on the H & H site, and this was the foundation for the Cumberland Pencil Factory. He suffered a stroke in 1876, when he resigned as a Trustee. His health faded from then on, and the well known Doctor l’Anson was in “constant attendance” for the last month of life. He died on 2nd December 1878 (34 years to the day after his wife). The funeral was at St. James Church on 6th December and he was buried in what was to become the family plot, number 1R178 at Preston Quarter Cemetery. This ‘roadside’ plot has an imposing gravestone, and was originally railed all around- the granite posts are still in situ. His will left most of the estate of around £35,000 to daughter Margaret, but there was to be sufficient money set aside to pay his grandson (also Robert) interest of £600 annually in equal monthly instalments, for the rest of his life. His son, Robert Henry, trained in the family business as a printer and bookseller. On 18th July 1849 he married Isabella Colton Robson at St. James Church. She bore him one son, who they called Robert. He was baptised on 23rd May 1850 at St. James Church. Sadly she died on 16th March 1855 and was baptised in the family plot at St. James. At the 1861 census Robert Henry is shown as retired, at the age of 42. He and his 11 year old son are living at the family home, 9 Lowther Street with 2 servants. Robert Henry was to live there for the rest of his life. Sadly the 1871 and 1881 censuses record him as an Imbecile. Presumably this was the reason for his early retirement. There is no way of knowing exactly what the meaning of ‘Imbecile’ was in this case. He died on 14th May 1882 and was buried in the family plot at Preston Quarter Cemetery. He left his entire wealth of £836/14/- to his son Robert. At the 1871 census he is recorded as an undergraduate at Queens College but at home in Whitehaven on Census night. The 1881 census records him as married but one of four lodgers at 21Edgware Road, Paddington, London- the home of a William and Matilda Woodward. There is insufficient information to locate the Marriage or a name for his wife. He attended the consecration of the new St. Nicholas Church on 30th August 1883. On census night 1891 he is a Visitor at Ellen Bank House, Harrington, said to be “living on his own means”, and shown as single again. It is interesting that he is not a widower, it is possible that the 1881 census was incorrect. At the 1901 census Robert is a Visitor at 95 Kings Road, Brighton with Elizabeth Housewood who was a Lodging House Keeper. Robert died at 51 Marine Parade, Brighton on 25th June 1907. From the gravestone at Preston Quarter Cemetery we know that he was buried at Brighton. However his death now sets up a bit of a mystery, to which the reader can make their own conclusions. He left all his wealth of £688/8/5 to one Nellie Schweitzer (nee Ransom). She was the wife of George. They had married in the Hannover square area of London in 1884. George was of German origin (born 21st November 1857), and a servant at the Junior Army and Navy Club, London in the 1901 census while Nellie was also lodging at 95 Kings Road, Brighton. Nellie (born in London in 1867) at an unknown date after the death of Robert made her will at Brockbank Solicitors, Whitehaven using notepaper from 51 Marine Parade. She left £7,559/10/3 of which £4,000 was in various shares, £3,000 in Cash and £500 in the Fox Lane properties. This suggests that she was living at 9 Lowther Street after the time, though what happened afterwards cannot be traced, although there is the suggestion of emigration to Canada in 1912. George next appears on the manifest of the SS New York. This states that he was widowed and had started his journey to a new life from his daughter’s home in Brighton. However it is not possible to find a death for Nellie (ever) so it is unclear what actually happened to her. George and Nelly had divorced in 1909 (reference J77/976/9648). He arrived at New York from Liverpool on 21st June 1915 and was subsequently naturalised as American on September 2nd 1921 when he was living at 241 Elm Street, New Haven, Connecticut. American Death Records are compiled by State, and those for Connecticut are not available before 1949. We know nothing about her life, except for her totally funding the rebuild of St. Nicholas Church in 1881 to 1883. This is interesting in itself given that the family had been at St. James Church until then. The last service in the old church was held on 20th March 1881, when Stewart Hall was the very new Vicar. (since 15th December 1880). He subsequently went to Christ Church, and surviving papers imply a dispute between him and the Vestry (PCC). It is on record that the closing service was taken by the Vicar of Drigg and Irton. Under the faculty Margaret was entitled to a free Pew in the new Church. When the new Church opened under the care of the new Vicar, Revd C.B.S. Gillings there is another interesting interlude. There is a file of papers at Whitehaven Record Office which record a dispute that dragged on for nearly a year as to whether this free pew also exempted her from paying the 12 pence in the pound of pew rent towards the Vicar’s stipend. Legal opinion on both sides was, at best, indeterminate. Eventually the Vestry backed down and refunded her the one year’s money paid and exempted her from future payments. She then gave the money back to the offertory for the poor of the Parish. She never married and died on 29th July 1902 aged 85 and was buried on 2nd August from St Nicholas in the family plot at Preston Quarter Cemetery . There is a photograph of her on page 5 of the “Whitehaven News” dated 7th August 1902, where there is a full account of her funeral (reproduced below). The carriage preceding the hearse contained the Rev C.B.S. Gillings, Dr. Welby l’Anson, and Mr Ralph Bennett, Solicitor. The carriage immediately following the hearse contained Mr Robert Gibson, nephew of the deceased lady, and Mr W.F. Hunter. The grave was dug within the family burying place, and there according to her request, the mortal remains of Miss Gibson were laid to rest. She was born within the boundaries of Whitehaven, and her home was from birth to death, within them, and the preacher also believed, though he was not quite sure, that her home has always been within the boundaries of the parish of St. Nicholas [It depends where on Scotch Street the early home was, as part of that street was in Holy Trinity Parish]. Certain it was that by far the greater part of her life had been lived within them. She had not been an absentee, but lived among her people and had been gathered to her people. For this reason the preacher could not tell the congregation anything connected with her life that they did not already know. She had left behind her lasting tokens of her interest in her native borough, and such substantial tokens as will keep her name, the family name, in remembrance for ever. The preacher alluded to the fact that she had completed 53 years of continuous residence in the house in which she died. He alluded to her love of privacy, to her dislike of parade and ostentation, and said that she practised habitually a dignified reserve. Respecting and appreciating that attitude, he would adopt it in reference to his words about her, they were brief but sufficient to indicate his sincere esteem for her character and for the part she has played in the allotted span of life. She had been left with unfettered power over a large estate, she had power to augment it and power to waste it. It had not shrunk by her employment of it, and in that fact she took pleasure. She was much touched by the confidence which her father, for whom she had the warmest and most unbounded affection, had placed in her and it was evident that it was her constant aim to justify his confidence. Whilst her health was good she took great pleasure in the numberless business duties which devolved upon her, but in later years she felt the strain which was imposed upon her. To her the call had come, “give an account of thy stewardship for thou mayest be no longer steward.” Her remains had been gathered to her people, and her soul, unto the garner of God. Appropriate hymns were sung during the service. That, however, is far from the end of the story as her will (Folios 593 to 600, 1902) is both long and interesting, as it sheds much light on her extended family and business interests. Anyone with a serious genealogical interest in the family is given a treasure trove by the details, which are heavily abbreviated here. Some personal possessions were left to friends- Margaret Isabella Browne of Penrith, Isabella Ada Browne, Emmeline Dora Browne and John Falcon, also to Lilian Hunter (daughter of relative Henry Hunter), Matthew James Denney (son of deceased first cousin Marths Denney) and her servant Bessie Fearon. (or their children over 21 if pre-deceased). £300 to St. Nicholas Church, to use the interest annually to buy Coals and warm clothing at Christmas for poor old women to be called The Gibson Coal and Clothing Fund. [ This charity existed until about twenty years ago when numerous small charitable bequests to the four Churches were conglomerated into one modern Charity]. £200 to Crosthwaite Church, Keswick , to use the interest annually to buy Coals and warm clothing at Christmas for poor old women (The Gibson Coal and Clothing Fund). £50 annuity to her servant Bessie Fearon. For anyone wondering where the bequest to Crosthwaite Church came from the will continues to tell us that she owned a Pencil Mill (see her father, Robert, above), Greta Hall and Greta Lodge at Keswick. It is unclear whether she had bought the hall and lodge since her father’s death or whether these were part of his estate. The Pencil Mill, Greta Hall and Greta Lodge were left to her nephew, Robert Gibson together with the freehold dwelling house of 9 Lowther Street and all contents not otherwise bequeathed and 3 freehold cottages at Fox Lane, Whitehaven. Again it is not clear if these cottages had been bought since Robert’s death. The rest of her estate was left as a Trust Fund to Robert Gibson or his child(ren). In the event of their being no children and his predecease it was to be split 31 ways to 31 named people (mainly the £400 shares people). This booklet has been researched and written for the Friends of St. Nicholas Gardens by Stuart Nicholson of the Parish of Whitehaven. The original idea and inspiration came from Margaret Crosby of the Whitehaven News on behalf of the Friends of St. Nicholas Gardens. The inestimable assistance of the staff of Whitehaven Record Office (in particular Archivist Robert Baxter in relation to the dispute on Pew Rents) in providing research advice and access to a variety of historical sources is acknowledged. The text may be freely reproduced, but the source must be cited.